Wow, I should have known you guys would be good at this sort of thing. I should have asked for the exact year, just to make it a bit of a sport. 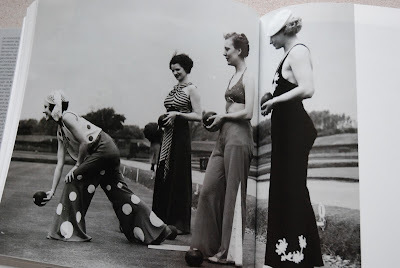 Marie-Noelle, Jenny Wren, redsilvia, Tanit-Isis, Readythreadsew and AlisonMM, you are all absolutely right: this picture is from the 1930's. From 1935, to be precise. But all of you were too smart to fall for that. P.S. Thank you all for your kind comments to yesterday's post. I know the photograph is horribly over-lit which makes this pair of trousers look a bit nasty, but bear with me please. She's had hip replacement surgery about three years ago. A style of implant which can handle more activity than the more usual style. Perfect for the active fifty-something lady she is. That was then. Unfortunately, this is a 'metal in metal' implant which, through use, sort of grinds itself down, releasing cobalt metal in the host's bloodstream. This causes swelling around the implant. Obviously, she is seeing all the appropriate medical professionals and she's already booked for another round of surgery. However, that still left her having to walk around with swolen hips, abdomen and lower back for several months. Which happened to be the only department where a loving daughter could be of any real help. She asked me for trouser which could be adapted to the swelling. She was thinking about buttonhole elastic at first, but I talked her out of that. Elastic waistbands still create a pressure line which has to be unpleasant with swelling on one's lower back. Instead, I made trousers with a wide waistband made out of jersey. What I did is very simple indeed and could work well or be adapted for anyone with any kind of size and shape issues (in fact, I've made this kind of waistband once before: for a pregnant friend. only then, I used a much higher piece of rib knit). I drafted a pair of straight legged trousers to her current hip measurement. Of course, you could also use an existing pattern. Summer issues of Burda often include wide legged styles like this. Take off all detail like the fly extention and pockets. Then, take a bit off the top. The trousers I drafted were fitted to the natural waist and I took off 10 cm. Extend the legline upwards, making what is now the top of the pattern piece as wide as the hipline. Do this at front and back. 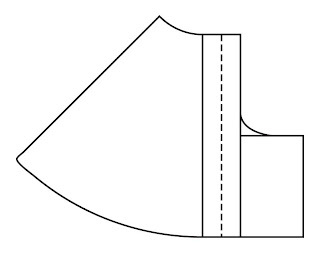 For the waistband, use the subject's current waist measurement and cut a waistband out of solid but stretchy jersey which is 10% smaller than that and 20 cm high, plus seam allowances. If you're using rib knit, go for about 20% smaller to compensate for the greater stretch of the material. For the legs, I bought woven fabric with stretch. In fact, with so much stretch that I would never by it for anything for myself. That was a good choice, because the swelling actually keeps increasing slowly. To sew the trousers, assemble the legs as usual, and sew the short end of the waistband together. Then you fold the waistband in half wrong sides together and pin it to the trousers, equaly distributing the excess fabric. Sew it on while stretching the waistband to fit the top of the trousers. My mother is quite pleased with these. In fact, they're the only bottoms she is wearing at the moment and as long as she wears them with long-ish tops, a lot of people don't even notice anything wrong. I'm posting this in the hope that it might help anyone struggling with different-but-similar issues (and I guess this method would also make very comfortable trousers for lounging about). So please, feel free to spread the word and if anything isn't clear, just ask. I've never done a post like this before, but I usually love them at other blogs (most notably at Couture Allure). 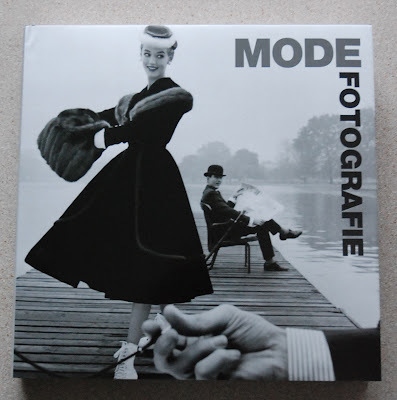 That is 'Fashion Photography' in Dutch. It's basically one of those 'fashion photography through the ages collections' (I was going to write 'through the decades' but it actually starts before 1900. Other than that, it is pretty much all of the 20th century). 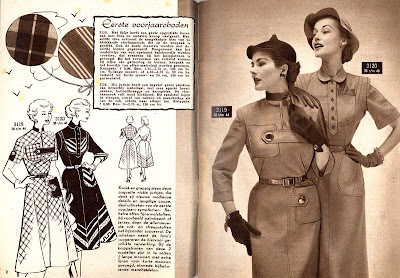 Although it misses some of the usual suspects (in fact, it misses pictures of creations from the biggest names altogether), like Dovima wearing Dior's 'Bar' suit, it includes other, lesser known and equally fascinating pieces of fashion history. Some of which are interesting and might be difficult to date without the strict 'by the decade' order of the book and the information with each picture. 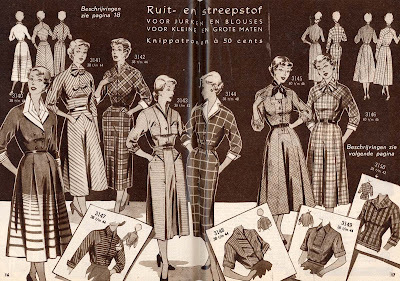 Last month, Peter wrote a series of posts about the weird world of forecasting and whether or not that effects us who make our own clothes. From that first post, I learned that the trend-colour for this spring was Tangerine Tango (I have in fact seen this colour appear in displays in shop windows since). Now, it just so happened that I scored 4 meters of this fabric on, again, sale for 1 or 0.50 euro a meter back in, about, October. I had first planned to use some of it for my draft-along dress, but we all remember what became of that... (hangs head in shame...). By the time I read the colour forecast post I wanted to make a circle skirt from it, preferable with flap pockets. Last week, I finally made something from it. A high waisted A-line skirt. It's a bit shorter than most of my skirts, it's lined and has these nice curved patch pockets without topstitching. 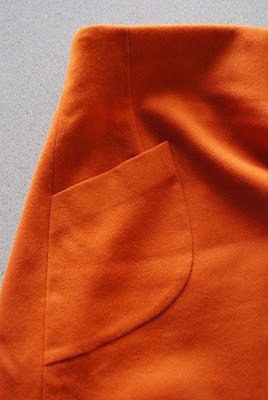 Here's a close-up of those pockets. You have to apply them before sewing the side seam and I really like their clean look. Well, I really like the skirt and like this, I have to say I love this colour. It doesn't even have to be worn with black. I would like it with brown, olive green and various blues and greys. Oh, and (cream) white. Today, I took some pictures of the shirt on the dress form. 59 years ago, you might be flipping through this issue of Marion, and considering what to make. Well, what does the world of fashion as translated by Marion bring this month? 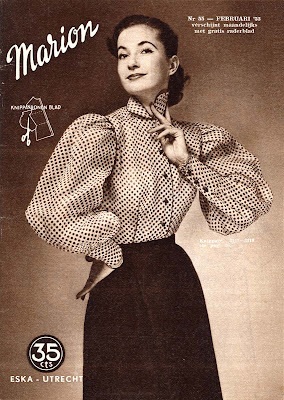 The bouffant sleeves of the cover design are really only featured in that one blouse. In patterns which come with the magazine, two-pieces with vest-like points on the tops/jackets are a big hit. Stripes and checks and patterns designed to work with them. 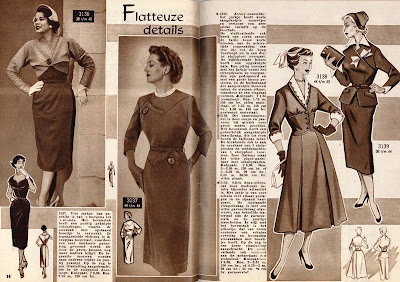 How cool are those raglan/kimono crossbreed sleeves (counting from the left, they are on the second and on the last dress in the row)? Well, here it is. I made a shirt with the curved collar from Pattern Magic 1. In fact, this is a fairly easy little project, but I'll try to show you a bit of the construction because, if you're used to sewing regular shirt collars, it is a bit counter-intuitive at times. I tried to take pictures to clarify the steps but it is really hard to take clear pictures of sewing-in-progress by lamp-light. So please, let me know whether or not this actually helps. First of all, it may not have been clearly on display in my previous post about this shirt, but this is the actual pattern piece for the collar. This is my version, which includes a 1 cm seam allowance. I normally use 1.5 cm, but I really recommend going for less here because these seams will all end up inside the collar and it will be much easier to manipulate its curves and angles with a smaller seam allowance. 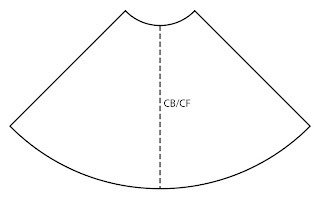 Just remember to match this 1 cm seam allowance on the collar edges of the bodice and on the neckline of the facing. And, as I mentioned before, you really need a facing for the front and back. I cut the collar with the larger piece, the actual collar, on the fold and used a light fusible interfacing. When sewing the shirt, the first step is to sew and finish the shoulder seams on the bodice and facing and, if you make a shirt like mine, sew the back pleat. Then, close the center back seam on the curve-bit of the collar and press open. the fabric) like a double ended dart. After that, sew the front edges for the collar by folding it right sides together (I marked the middle of the collar piece, where you should fold it, with a notch) and sewing it down. Make sure not to sew down the seam allowance at the edge. That's the prep work on the collar done. Now, it's time to start attaching it. First step is to sew the point-bit of the collar pieces curve bit to the point at the front bodice. This is exactly where you took it out in the pattern making stage. Refer back to that and it can't go wrong. Just make sure not to sew down to far. The next step is to sew the collar edge onto to bodice, beginning and ending at the ends of the seams you've made in the previous step. This should give you neat little corners on the front bodice. Now, sew the facing to the collar neckline (the curvey bit) and along the front opening. With that, the construction is basically done. 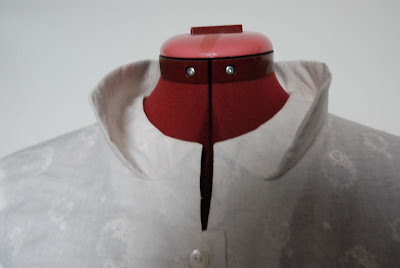 Pattern Magic tells you to stitch parts of the collar to facing by hand. I opted for stitching in the ditch (not all the way round. Just a couple of cm at the front points and along the center back) instead, which so far seems to work just fine. To add some details about my shirt, the fabric is a cream coloured, fairly soft cotton. I don't normally go for this kind of embroidery decoration but I bought it, once more, on crazy sale at the market, so I figured I could always use it for muslins. As it turned out, I actually like it. As mentioned in my previous post, I made a center back pleat which I closed from the waist down so the shirt can be tucked in neatly. I added very simple plain three quarter length sleeves, on a natural shoulderline. After some consideration, I added one chest pocket. With that it's not just about the collar. When I wore this outfit to take a picture, my boyfriend came in. He first said he liked the look. Only then, he asked: 'is the collar supposed to stand up like that?' Of course, I said yes and he said it was nice, but the point is this: it is both a very strange and a very subtle detail. Just how I like it. Heh, heh, thank you for the enabling words about my recent fabric purchase. I should know by now to trust fellow seamstresses to understand the temptationsof good AND cheap fabric. 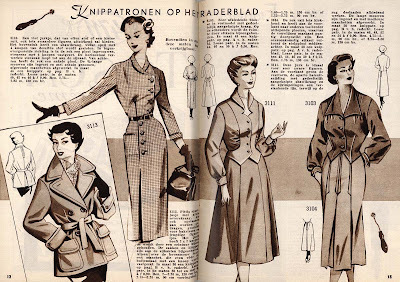 In this post I will, as promised, try to explain how to draft the pattern for those culottes. 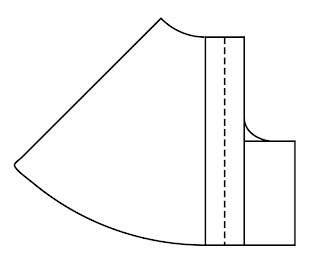 In any pattern making method, culotte patterns (or split skirts or whatever you may call them) are based on skirt blocks. For this pair, you start out with a half-circle skirt. Draft one of those is very easy and quite similar to drafting a circle skirt. 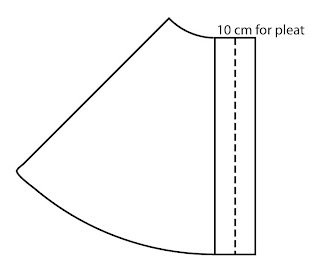 Anyway, for the culotte pattern you will need your waist circumference, hip height (vertical distance from waist to hip) and sitting height (when seated straight, this is the vertical distance from waist to chair). You may know these measurement by different names, not all charts use the same names for the same things and I'm translating from Dutch. 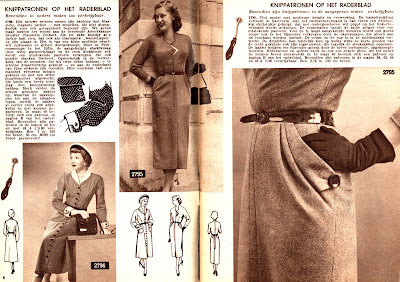 If you want to make a more low-slung version, substitute 'waist' for 'where-ever you want the waistband to sit'. Just make sure you measure to the same 'waistline every time. You only need to draw a quarter of a circle, so I usually start with the corner of a piece of paper as the center of the circle. When you have drawn the waistline, draw the hemline at the distance you want. One my culottes, that was about 40 cm. This is the end result. 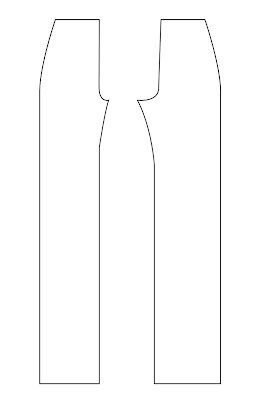 Make sure to mark the center line (most easily done by folding the cut-out pattern exactly in half). Front and back of the skirt are the same. 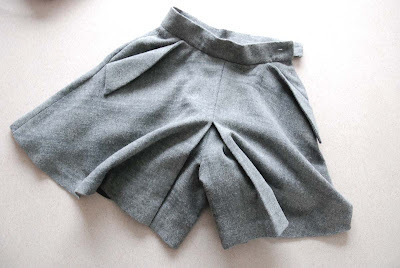 To make the skirt pattern into a pattern for culottes, cut the pattern piece along its center line. First, add 10 cm to the center front/back lines of both pieces. This is for the front and back pleat. 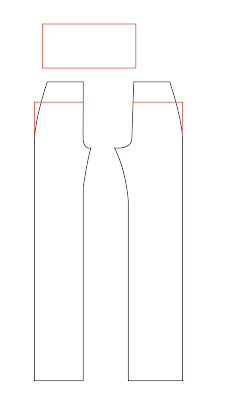 Then, measure along the center front line and mark the sitting height. From that point, draw a line at a right angle from center front, the length of which should be 1/10 of you hip circumference + 2,5. Square down to the hemline. Now, mark the hip height on the center front line and draw a gentle curve from that point to the middle of the line. Repeat the previous step at the back. Only here, the length of the line should be 2/10 of your hip circumference - 3 cm, creating a more roomy crotch curve. You can add seam allowance either on the paper or on the fabric. Both pieces should be cut twice with the center front and back on the straight grain. I only just managed to cut my, rather short, version out of folded fabric of 1,40 meter wide. So, if you have a bigger size (I'm about a Burda 36) and/or want your longer, expect to need about the desired length times 4 in fabric. To assemble, sew along the original center front line for about 15 cm, partially closing the front pleat. Then, sew the front crotch curve. Repeat these steps at the back. Then, sew the inner leg seam and then the outer one, leaving about 18 cm open on the left side to insert a zipper. Insert the zipper and sew on the waistband. Hem. My culottes are lined. I omitted the pleats in the lining to reduce bulk. This works fine. Otherwise, you sew the lining like the outside, attaching it to the zipper before you sew on the waistband. 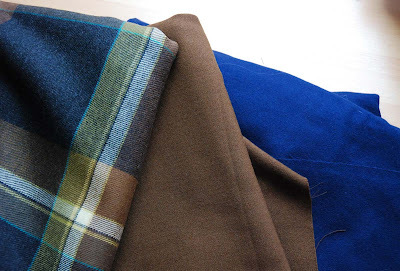 Outside and lining are treated as one when sewing the waistband. I've hemmed them seperately, as I usually do on flared skirts. This also means you could make these culottes just the same without the pleats, but I think those box pleats add to their almost-a-skirt look. I hope this how-to makes sense to you. Feel free to ask if anything isn't clear. As usual, if you make something using this tutorial, please drop me line in the comments, I'd love to see it. ... but that doesn't mean I can resist a good deal when I find one. Last weekend, I braved the snow and freezing temperatures and walked (I usually cycle, but that was not an option because of the weather) to the local market. Obviously, I went there to buy fruit and vegetables for the coming week, but just as obviously I couldn't not look at what the fabric stalls had on offer. And my favorite one was having a sale on colourful wool fabrics. No big bolts, mostly bits towards the end of rolls, 2 or 3 meters a piece, at 1.50 euro a meter... leftovers from a suit workshop. P.S. Thank you all for your nice comments on my culottes! In fact, although I did draft my own pattern, this is an easy one, so I'll try and make a tutorial for it this weekend. P.S.2 I've just finished the curve collar shirt, so as soon as I've been able to take pictures of the finished product (over the weekend as well, I suppose), there will be a construction-and-result post of that as well. Last night, I got some uninterrupted sewing time and I have to say I'm making good progress on the curve collar shirt. That collar is on, it's just sleeves and finishing now. I'm not sure how well I've been doing on documenting important instruction details for any of you who may want to make something similar but we'll have to see about that in another post. Now, I want to show you the project I sneaked in before starting on the shirt. Short half circle skirt? No. Culottes. Seriously. If I had ever made a list of weird items of clothing which are unloved by a vast majority of people to try and make work for me, I'd almost be through with it by now. Shorts? Check. Jumpsuit? Check. Culottes?? And.... check. 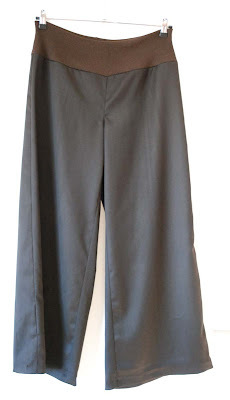 The thing is, I had the basic idea for very flared culottes at the back of my head for a year or so. The fabric has been in my stash for at least as long. Once more, bought very cheaply on one of those everything-must-go crazy sales at the market where I found it among mountains of nasty polyesther. It's largely wool and has a rugged sort of texture. I've liked it all along but I knew it would look frumpy in any kind of 'normal' garment. Go for short or for a strange pattern, it seemed to say. Last December, when I decided not to use this fabric for a wide skirt, the two finally came together. 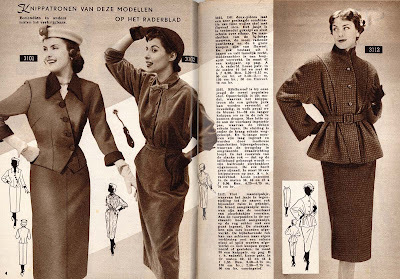 I still didn't start drafting the pattern until the last week of Januari. And by then, I had added another element to the mix. While looking through those vintage Marion magazines, what jumped out to me from the pages of those from 1952/53, where the pockets. Endless variations of cleverly drafted pockets. Not just your normal scoop, slash and patch pockets but also hybrids of those and versions decorated with band and flaps of all different kinds. Because these are culottes, they feel quite a bit more safe than any skirt this wide and short ever could. I think I could ride a bicycle in these (which, being a Dutch girl, is major priority for me). Look: I can move without any trouble! And twirl without indecent exposure! I'll have to wait and see how well I can actually make these work in my wardrobe, but I think I reached my goal in making a pair of culottes which, at least to me, are fun. Once again, I've sort of promised you something of which I wasn't quite sure how to do it. And then, I didn't get to it in the time I said I would. I know: What else is new? Luckily for me, I didn't promise a how-to (mainly for reasons of copyright. if you want to know how to draft that collar, you'll have to buy or borrow Pattern Magic 1). 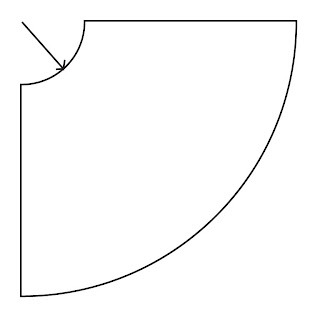 So, here's my not-a-how-to of the pattern for my design including Pattern Magic 1's curved collar. 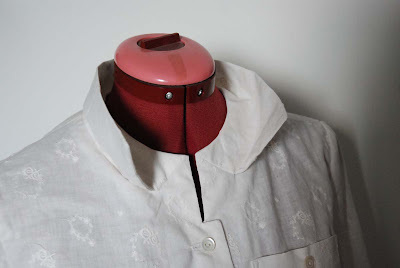 I started out with the pattern I made for my little silk shirt which, at least in my mind, is a pretty basic semi-fitted shirt (if it got a tiny bit snug in the bust in its silk incarnation, that's because of those pintucks). I kept the bust dart and folded the front pattern piece at the center front line. From there, I followed the instructions for the collar as they are explained in the book. At the back, I decided not to use the waist dart. I also added 6 cm all along the center back (which was already meant to be cut on the fold) for the back pleat. If I decide to have it stitched up from the waist down, I may still remove the extra fabric below that point. But for now, I keep the options open. Here as at the front, I just followed the book's instructions for that neckline. 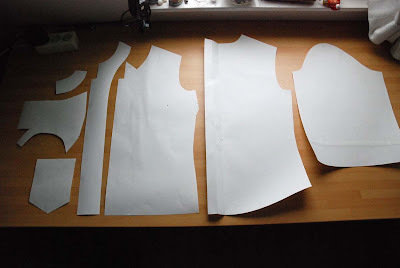 What you may not realise if you use Pattern Magic in Japanese, is that you will need a front and back facing which reach up to the actual neckline of the garment (so, the inner neckline of the curved bit, not the 'neckline' on the bodice pieces). Now, I've cut these pieces from my fabric. I've placed the center back of the collar itself (and not the curved bit) at the fold, so I'll let you know whether or not that was a good decision. 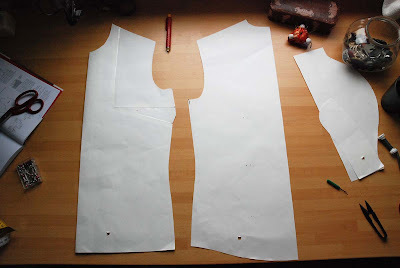 I intend to use a lightweight interfacing on the collar and facing. I'm going to start sewing now. I'll be back with an update as soon as I have anything to tell.